The personal computer revolution of the 1970s was made possible by a unique combination of cultural forces and technological innovation in the San Francisco Bay Area. Figures such as Douglas Engelbart, Stewart Brand, Bob Albrecht and Lee Felsenstein recognized the potential of computing technology to transform the life of the individual and worked to bring computers out of the realm of government, industry and academia and into public life. Initiatives like the People’s Computer Company and the Homebrew Computer Club led to widespread knowledge-sharing and early software standards, enabling the production of the modern commercially available personal computer. 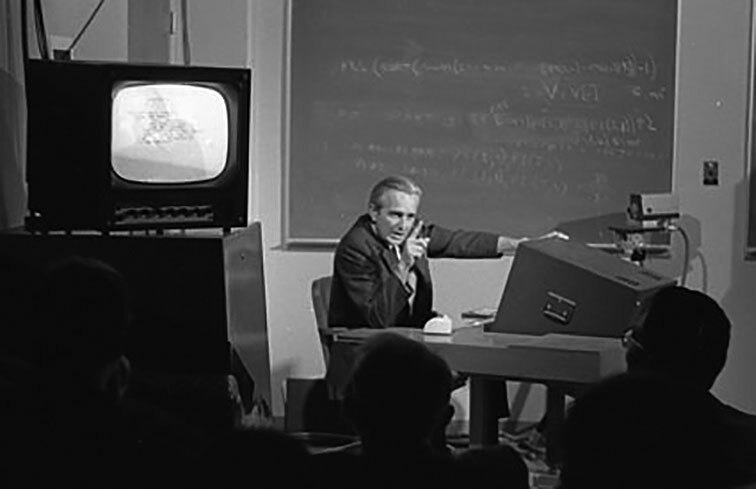 On December 9th, 1968, at a presentation at the Fall Joint Computer Conference in San Francisco, engineer Doug Engelbart stunned the audience in a 90-minute presentation that later became known as “the Mother of all Demos.” The talk introduced the computer mouse for the first time and incorporated concepts such as social networking, bitmapped screens and windows, teleconferencing, and real-time collaboration which would become fundamental to personal computing. (3) The blockbuster event appeared to some to herald a new age in the tech industry, but truthfully the philosophy behind Engelbart’s work, which focused on user-friendly interfaces and accessible computing rather than automation, had been stirring around the Bay Area for some time already. The unique blend of technological and cultural forces in San Francisco during the 1960s—the meeting of counterculture and cyberculture—made the computer what it is today. 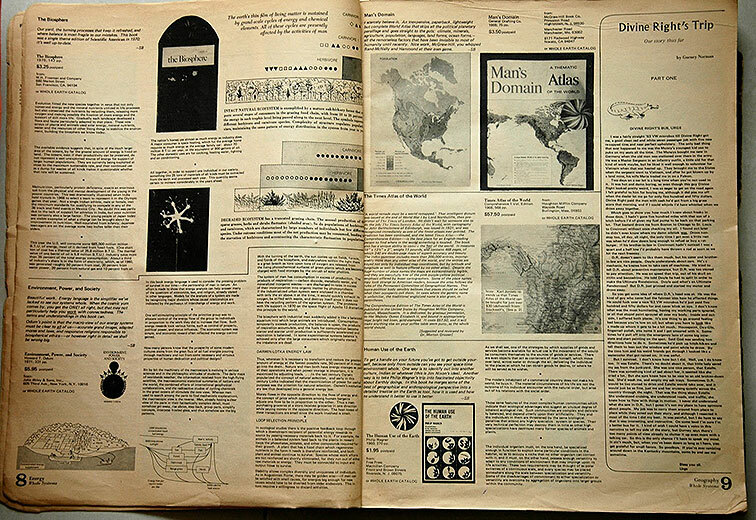 A spread from the Whole Earth Catalog. First iteration of the Community Memory Project in Berkeley, 1974. Among those sitting in the audience the day of the demonstration was Alan Kay, who followed Engelbart’s work at the Augmentation Research Center and was reinvigorated in his quest to build a personal computer by the progress he saw before him. Kay was recruited to work at Xerox PARC and dreamed of creating a truly portable PC, one the size of a notebook that a child could operate.Stewart Brand interviewed Kay at Xerox PARC for a 1972 article on emerging technologies in Silicon Valley, and enthusiastically wrote that the research there had moved “away from hugeness and centrality, toward the small and the personal, toward putting the maximum computer power in the hands of every individual who wants it.” (4) This new focus, and the preceding technological innovations that made it possible, also enabled hobbyists not affiliated with large corporations or research institutions to buy their own machines and make modifications as they saw fit. The combination of do-it-yourself opportunity and the communalist mentality of knowledge-sharing manifested in the Homebrew Computer Club. The Homebrew Computer Club, whose founders met at the Community Computer Center in Menlo Park, was a biweekly meeting for computer enthusiasts to swap parts and share ideas and circuitry designs for building homebrewed computers. It took place in a garage, and Lee Felsenstein served as moderator for the sessions, whose members went on to found several companies in the technology industry. Most notably, Steve Wozniak built the Apple I after he was enthralled by the first Homebrew Computer Club meeting. When Wozniak and Steve Jobs founded Apple, they toured Xerox PARC and licensed several of the developments that Kay and his team had made. (4) The results of those visits are well-known: Apple was first to market with a commercial personal computer intended for the masses, and became an incredibly successful multinational company. Several factors contributed to the San Francisco Bay Area becoming the birthplace of the personal computer; certainly, the influx of defense contractors and establishment of the Stanford Research Institute and Stanford Research Park contributed to the area’s dominance in the industry. But East Coast institutions had older, stronger ties to government funding and computing research. It was the blending of formal research institutions and the do-it-yourself hacker ethos that set the Bay Area apart, the San Francisco counterculture that influenced mainstream culture. Doug Engelbart, Bob Albrecht, Stewart Brand, Lee Felsenstein, Alan Kay and countless others involved shunned traditional institutional authority in favor of putting power in the hands of individuals. They saw technology as an equalizer, the Internet as a democratic community that could give a voice to the alternative. While tech is increasingly commodified, movements for educational equity and open-source software pay homage to this vision today. Brand, Stewart. “The Purpose of the Whole Earth Catalog.” Whole Earth Catalog. Fall 1968. Web. Accessed 5 Mar. 2017. Doub, Bo. “Community Memory: Precedents in Social Media and Movements.” Computer History Museum. 23 Feb. 2016. Web. Accessed 5 Mar. 2017. Doug Engelbart Institute. “Living History: The Doug Engelbart Archive.” Doug Engelbart Institute. 2008. Web. Accessed 5 Mar. 2017. Isaacson, Walter. The Innovators: How a Group of Hackers, Geniuses, and Geeks Created the Digital Revolution. “The Personal Computer.” New York: Simon & Schuster Press, 2014. Print. Nelson, Ted. Computer Lib. Seattle: Microsoft Press, 1987. Print. Rothstein, Edward. “A Crunchy-Granola Path From Macramé and LSD to Wikipedia and Google.” The New York Times. 25 Sep. 2006. Web. Accessed 18 Mar. 2017. Sirius, RU. “Counterculture and the Tech Revolution.” 10 Zen Monkeys. 19 Nov. 2006. Web. Accessed 18 Mar. 2017. Silicon Valley Revolution. Dir. Jan Tenhaven. Berlin & Beyond Film Festival, 2017. Film. Turner, Fred. From Counterculture to Cyberculture. Chicago: The University of Chicago Press, 2006. Print.